It shows PackeSave's current status. By tapping this part, the status changes. This is a state in which PackeSave is operating normally. Some of the apps cannot communicate according to the settings. The text right of the circle pic explains the detailed operational status. You can stop PackeSave temporarily or entirely by tapping. 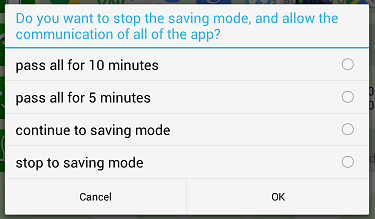 By stopping PackeSave, all the apps can communicate. When you want to use an app that has not been registered, it is possible to use this feature. This is a state in which the operation of PackeSave is stopped. When you tap, PackeSave will start the operation. This is a state in which the operation of PackeSave is prohibited because the "VPN connection" is not allowed. When you tap, PackeSave will start operation with the permission of the "VPN connection".